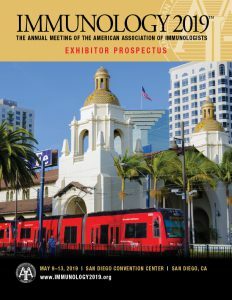 Book your space now for IMMUNOLOGY 2019™, May 9 – 13, at the San Diego Convention Center in San Diego, California. AAI hosts the world’s leading annual all-immunology meeting, bringing together scientists at every career stage to discuss their cutting edge research. International leaders in immunology and talented trainees will be coming to learn what innovations and biomedical advances can benefit them in their research. Attendees include university faculty/principal investigators, corporate scientists, government scientists, researchers at independent institutes and foundations, and members of more than a dozen guest societies. Sell! 82% of 2018 attendees surveyed are involved with their lab’s purchasing decisions. 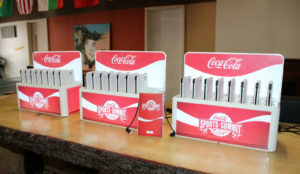 Prospect and Extend Your Market Reach. 60% went to the Exhibit Hall to find a new supplier. If you’re interested in exhibiting, please contact AAI Exhibits Manager at 301-634-7821 or exhibits@aai.org. Submit your Exhibit Application Form online today.